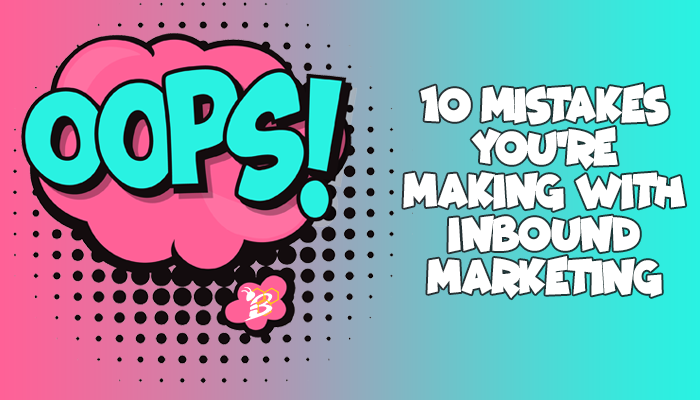 Let’s review some of the most common inbound marketing mistakes we see and how you can fix them. 1. Poor strategy - Not having a strong inbound marketing plan. This problem manifests itself in a number of different ways, but the symptoms are all the same: poor planning, inconsistent results, and uncertainty of what to do next. When we work with a company, one of the first steps is to create a Growth Plan. This plan provides you with a complete analysis of your company’s current marketing, a series of realistic marketing and sales goals, and strategies to meet those goals, along with the training and support needed to accomplish those goals. When a company lacks an airtight strategy, it leads to many of the other problems in this list. Inexperienced inbound marketers often hear about incredible results from other companies, which is why they’re excited about developing an inbound plan in the first place. However, this excitement sometimes makes people get ahead of themselves. Setting unrealistic goals, like tripling your conversion rate in a month or becoming the top search result on Google in a short period of time, can lead to disappointment and frustration. Unrealistic goal setting also means that your short-term strategies are often mismatched, and you end up spending time and money on all the wrong things. Realistic, challenging goals should be your priority. 3. Using a weak lead scoring system. Lead scoring can be a secret weapon for a business, but only if it’s done well. When you score a lead, you are essentially examining data about your prospective buyer to determine how much time you should spend on selling your product or service to them. It helps your sales and marketing teams understand which stage of the funnel someone is in and helps your sales team prioritize who they should spend their time on - those in the bottom of the funnel. Lead scoring sounds awesome--who wouldn’t want to have a strong method for determining the likelihood of a prospect converting into a buyer? However, lead scoring can also be a huge time waster if it’s not done well, or if it’s treated as a one-size-fits-all approach. 4. Not maintaining a blog, or maintaining a BAD blog. The perception of blogging has changed dramatically over the years. Today, most businesses make one of the following mistakes - either they think their blog is a place to tell everyone how great they are or they start blogging and give up after a couple months because of the time commitment. Yes, blogging does require a large time commitment, but it is all worth it if you're doing it right. You should aim to blog at least once per week with educational and helpful content. Your blog is not a place to brag or try to make a sale. It's an opportunity to educate your prospective customers, establish yourself as an industry expert, and as a way to increase traffic to your website. 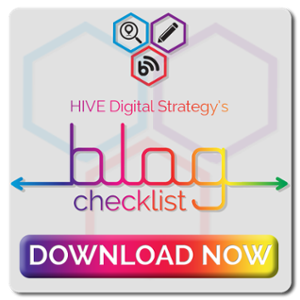 If you're not sure how to accomplish this, we encourage you to download the HIVE Blog Checklist! 5. Social media that is disconnected and outdated. It’s not enough to have a Facebook page and a Twitter account with your company’s information available. Your social media plan should be cohesive between multiple accounts, each targeted to specific target personas found on the platform you’re using. Your social media plan should also include things like targeted ads, retargeting, and dynamic content. Ideally, your platform use should create high levels of community engagement, with plenty of likes, comments, and shares. 6. Sending out email blasts to all of your subscribers. Promotional emails clutter up all of our email inboxes, leading us to unsubscribe, and if you're not providing personalized and relevant content, you can easily annoy your prospects. However, email is still an important part of the inbound marketing strategy and one of the most successful marketing tactics, when done well. When you collect email addresses through a buy-in promotion or use of an app or shopping cart, you want to make the most of those! Instead of general email blasts that go out to everybody in your mailing list, you should create specific, targeted email campaigns to as many small groups of people as possible. 7. Trying to be everything to everyone. When you try to be everything to everyone, you end up being nothing to anyone. You are not the right match for every single prospective customer. Your company is unique, and you should try not to lose sight of that. Companies that try to be everything to everyone end up being one of two things: either really generic or really overwhelming. You should prioritize the customer profiles of people who are the most likely to convert into buyers, and then market to those people. Don’t waste time trying to sell to every single person who sees your company’s name. Instead, focus on the people who have a much higher of percentage of becoming a customer. 8. Not having a method for testing, evaluating, getting feedback, and adjusting your plan. Having an effective marketing plan in place is great, but what is your system to evaluate its successes and failures? What is the protocol for looking at a Facebook ad campaign that has just wrapped up and deciding what its strengths and weaknesses were? Why did it succeed where it did? What factors contributed to its weak performance in other areas? How will you change your next ad based on the data you collected from this one? People who forget to do this important closing task at the end of a campaign are never going to advance the way that highly effective evaluators do. To be fair, everybody starts out without experience. However, when you have a gap in your experience and knowledge, you need to do what you can to fill that gap. Sometimes, that may mean taking classes. Other times, it’s hiring a consultant or outsourcing your inbound marketing work. What you don’t want to do is trust that just because someone has some cursory familiarity with the concepts of inbound marketing, they are the right fit for your needs. Make sure that the decision maker is experienced or guided by those with experience so that you can avoid beginner mistakes. 10. Being too “salesy” in your SEO content. When crafting inbound content, you want to avoid developing an off-putting, sales-centric tone in your writing. Prospective customers pick up on subtle cues that tell them what you’re writing is really just an ad. You don’t want to hide the fact that you’re advertising a product or service--that looks sneaky and is pretty obvious to savvy consumers--but you do want to keep from making your prospective customer feel like your whole point is to sell something to them. Instead, content should be informative, interesting, educational, and relevant. All of these issues are important to consider when developing your inbound marketing plan. Novices should be aware of these pitfalls in order to avoid them. Whether it’s something you can fix quickly or something you need outside help to remedy, focusing on one or two of these at a time can start improving your effectiveness and efficiency as an inbound marketer. 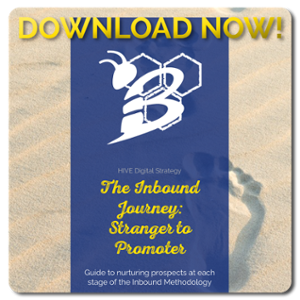 If you're just starting out on your inbound marketing journey, we encourage you to download our FREE eBook - The Inbound Journey: Stranger to Promoter.